In conjunction with the launch of the “Naturally Remarkable” campaign in 2011, America’s snack nut brand Planters introduced a completely new plastic package developed by packaging manufacturer Sonoco. 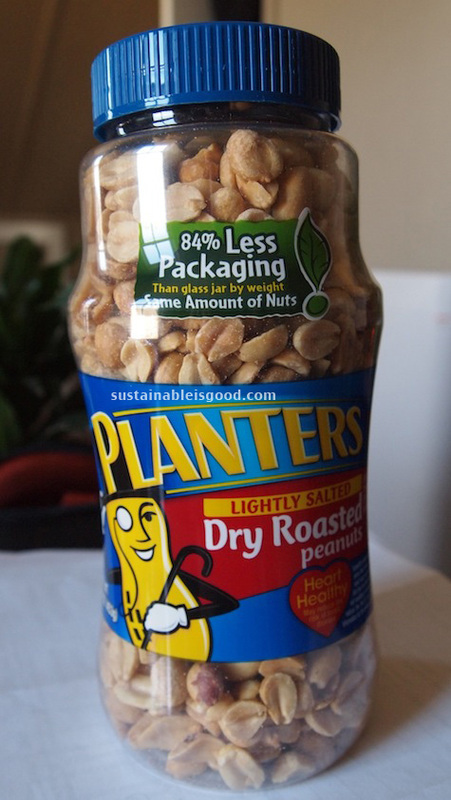 According to Sonoco, the new plastic package is 84% less than the original packaging, while still meeting the Planters brand’s quality targets. The significant reduction in packaging materials lead to several benefits, including a 25% reduction in the number of trucks required to transport Planters Dry Roasted Peanuts. Additionally, the durable and light-weight solution is 100% recyclable and BPA free. Sonoco notes that Planters and Sonoco share a commitment to sustainability and have a longstanding relationship that includes collaboration on many new products. For this “Naturally Remarkable” initiative, Sonoco had the capital and expertise needed to produce a sustainable container that met the company’s product protection and shelf life requirements. As part of its commitment to sustainability, Planters launched the “Naturally Remarkable” campaign, designed to help grow stronger communities and raise awareness of sustainable farming practices. In 2011, Planters transformed open spaces in New Orleans, Washington, DC, and New York into Planters Groves – vibrant, peanut-shaped green urban parks that are part urban revitalization, part art. Additionally, Planters has made considerable investments in greening its facilities through better energy and water conservation practices, as well as waste reduction.